Waterloo Black Hawks coach P.K. O'Handley isn't taking anything for granted despite the fact his team was pegged by many as the favorite to capture the Clark Cup as champion of the United States Hockey League this season. Surprising Waterloo lost a five-game series to the Green Bay Gamblers in the championship round last spring. The Hawks hope for a better ending this season, and they're off to a fast start: through seven games, Waterloo has a 6-1-0 record while outscoring the opposition 33-19. "We don't have a lot of guys who were in that series [against Green Bay], but the guys who were high-profile players are passing what they learned on to the other guys," O'Handley told NHL.com. Four players who experienced the agony of a 5-2 defeat in Game 5 of the final against Green Bay return in 2012-13 with high draft aspirations: defenseman Ian McCoshen, forward Taylor Cammarata and goalies Eamon McAdam and Cal Petersen. All four participated in the inaugural CCM/USA All-American Prospects Game on Sept. 29 and are considered top prospects for the 2013 NHL Draft. NHL Central Scouting ranked McCoshen an A skater on its preliminary ranking of players to watch for the 2013 NHL Draft, and Cammarata is a C skater. McAdam is ranked as a B goalie; Petersen is a C goalie. "It is good and potentially bad [to be considered one of the favorites]," O'Handley told NHL.com. "I don't think there's anything wrong with recognizing we have some talent. I think our concern as a staff is to make sure our talent understands that they're not in the NHL yet and they have to work every day in this league -- and if, as a group, we do that within our framework, we'll be successful." O'Handley said he plans on giving each of his talented goalies equal playing time at the outset. "They are both very good," he said. "I think once we get into a rhythm of playing games, [the goalie of choice] may sort itself out. But both are going to get their time and both deserve it. They'll have to deliver and give our team a chance to win … individual success for them will come in the form of team success." According to NHL Central Scouting's Al Jensen, who specializes in goalies, McAdam offers more of a positional, blocking style. Petersen, in Jensen's opinion, possesses quick athleticism within the crease. McCoshen is one of five players in the United States Hockey League who is ranked on Central Scouting's A list. "He's a kid that I would want as my son," O'Handley said. "He's very aware that he needs to continue to work on his game every day, but his competitiveness is off the charts. The sky is the limit for him." Will Butcher, D, USNTDP -- The 5-foot-9.5, 191-pound offensive-minded defenseman offers tremendous speed and intelligence and is instinctual with the puck. A left-handed shot, Butcher has good vision, is calm in transition and can quarterback the power play. 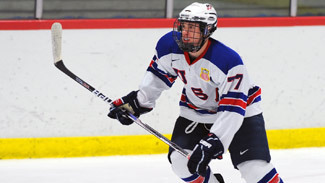 "He's not big, but he has a lot of hockey sense and he's a guy we'll look to for some positive things on our power play," U.S. National Team Development Program coach Don Granato told NHL.com. Butcher and teammate J.T. Compher were members of the team that won a gold medal at the IIHF 2012 World Under-18 Championship during the summer. He also starred on the National U-17 team that captured first at the U-18 Vlad Dzurilla Tournament. In 46 games with the U-17 team, the University of Denver commit had eight goals and 31 points in 2011-12. A native of Sun Prairie, Wis., Butcher has two goals and six points in 11 games for the USNTDP Under-18 team (4-6-10) this season. Prior to taking the reins as coach of the Under-17 National Team Development Program last season, Don Granato had gained plenty of experience as a scout and coach at the professional level. He served as a scout for the NHL's Vancouver Canucks in 2010-11 and was an assistant coach with the NHL's St. Louis Blues in 2005-06. He was awarded the Louis A.R. Pieri Memorial in 2001 as the American Hockey League coach of the year while with the Worcester IceCats. Granato knows the pressure that many of the top draft-eligible players on his NTDP U-18 team will face this season. It's something he reminds his players of each day. "Scouts aren't drafting guys who are 24 years old; they're trying to gauge where an 18-year-old might be in three years," Granato said. "Some may have the talent that separates them from the rest, but after that you're looking at attributes such as potential, work ethic, character, body type and, maybe, speed." Granato's roster is chock-full of talented players this season, seven of whom are rated either A or B skaters on NHL Central Scouting's preliminary list of players to watch from the United States Hockey League. "I like the makeup of this team," he said. "We have a great group of guys to work with. Our goal has always been to be victorious at the U-18 World Championship, which is in Sochi, Russia, in April." One player from Granato's team considered to be an early-round choice on many draft boards is forward J.T. Compher, who, along with wing Hudson Fasching, is ranked as an A skater on Central Scouting's preliminary players to watch list in the United States Hockey League. NHL Network analyst Craig Button has Compher ranked No. 16 among his Top 30 prospects eligible for the draft in June at Prudential Center in Newark, N.J.
"When you look at the package that J.T. has, it's skill, it's a competitive spirit," Button told NHL.com. "The biggest thing is, you watch a player that can skate and make plays, but he does it at high speed and at pace and tempo. He's just a threatening player when he has the puck. And when he doesn't have the puck, he wants the puck." J.T. Compher, C, USNTDP -- Granato likes the ultra-competitive center's two-way game and sees it developing well at the next level. "He's hard to play against … as a 15- or 16-year-old last year with the U-17 team, I'd match him up against the top lines," Granato told NHL.com. "He's a natural competitor, good in the faceoff circle and along the walls. He's got a lot of grit." Compher led the U-17 team last season with 27 assists in 40 games and was second with 53 points. He added six goals and three assists in 14 games with the U-18 team. Internationally, he helped the United States win a silver medal at the World Under-17 Hockey Challenge with a team-leading six assists and nine points; he also had five points and a plus-7 rating in six games as the United States won gold at the IIHF World Under-18 Championship. Compher, who usually is joined by linemates Tyler Motte and Hudson Fasching, has two goals and three points in six games this season -- he's missed the past five games with an injury. Still, NHL Central Scouting's David Gregory likes what he sees from the 5-10.5, 184-pounder and considers him a legitimate first-round candidate next spring. Compher is committed to the University of Michigan for the fall of 2013. "He has a great combination of skills and hockey sense, but he can also do a lot of things with the puck and has a great work ethic to boot … that makes him a tough package to play against," Gregory told NHL.com. USA Hockey assistant executive director of hockey operations Jim Johannson likes Compher's versatility and ability to adapt to any type of situation. "He's a very versatile player, and all parts of his game have blossomed," Johannson said. "He's explosive, brings energy and has great offensive instincts. He has a real high compete level for 200 feet of the ice. I say he's versatile because of how hard his compete level is, and he's suited well to today's game because he has speed, energy and can play in all situations." Michael Downing, D, Dubuque -- Downing, also committed to the University of Michigan, was the youngest player on the Fighting Saints roster last season. Despite his age, he played 59 games and produced five goals, 11 assists and 72 penalty minutes along the blue line, helping Dubuque to a third-place finish in the USHL's Eastern Conference. "As a pro, I picture Downing to be an unbelievable shutdown and contain defenseman," Gregory said. "I can see him controlling the play in his own end and then triggering the transition. He has so much ability with how he handles the puck and skates … he adds a big reach and has the size (6-2.75, 190). "I believe he thinks he's going to be [an] offensive defenseman, but at this level, he could probably do that and get into the play and get back without a problem. But his real strength will be when he understands what type of defenseman he'll be, and teams will go nuts over him." Downing, listed as an A skater on Central Scouting's preliminary ranking of players to watch for USHL players, has three assists, 19 penalty minutes and a plus-7 rating in seven games for the Fighting Saints (7-0-0) this season. Hudson Fasching, RW, USNTDP -- The 6-foot-1.75, 213-pounder is a prototypical power forward with good hands in tight spaces and around the net. Fasching impressed the scouts enough at their last viewing to be regarded as an A skater entering the season. "You look at his size and how he moves with his size, and there's potential there," Gregory said. "You just want him to do a little more. He's definitely in the top five in the USHL and he's going to battle and people will always expect so much out of him. Once he adjusts, he'll do fine." Committed to the University of Minnesota next fall, Fasching is very instinctive about using the body to shield and protect pucks in order to get to the net. Scouts rave about his good offensive instincts in the crease as well. He has three goals, seven points and 19 penalty minutes in 11 games for the NTDP U-18 in 2012-13. Blake Heinrich, D, Sioux City -- Gregory had high praise for the 5-10.75, 192-pound defenseman, who turned plenty of heads last season as a junior at Hill-Murray School in Minnesota with his puckhandling and physical brand of play. Nicknamed "The Hammer," Heinrich, a B-list skater, had 11 goals and 24 assists in 31 games. "He's a player with unbelievable skating, unbelievable puckhandling and great hockey sense," Gregory said. "He's not afraid to be nasty and not afraid to step up and pop you … he'll take advantage of you if you're not thinking. I think he's selective with it, and for good reason. He'll be a small D-man in the NHL, but he has too much ability and skill moving the puck and he always puts himself in good situations where he won't get hurt." Heinrich starred for Team Northeast in the Upper Midwest High School Elite Hockey League in 2011, totaling four goals and eight assists in 24 games. He also was selected to play for the Minnesota Red team in the league's season-ending Bauer National Invitational Tournament. He has four assists, including three on the power play, 14 penalty minutes and a plus-4 rating in seven games for the Musketeers (2-2-3) this season. Heinrich, committed to the University of Minnesota-Duluth for the fall of 2013, also was drafted by the Portland Winterhawks in the 12th round (No. 262) of the 2012 Western Hockey League bantam draft. Luke Johnson, C, Lincoln -- Johnson, a 5-11, 167-pound A-list skater, played at Grand Forks Central in North Dakota where he won a state championship. The son of former Lincoln Stars coach Steve Johnson and nephew to current Stars coach Chad Johnson is a University of North Dakota commit after he had 20 goals, 55 points and a plus-22 rating in 55 games in 2011-12. "He can do lots with the puck and probably has one of the best releases in the draft," Gregory said. "The puck comes off his stick with such quickness, speed, and grace … it's an effortless thing. At the USHL level, he will be a dominant player and will warrant first-round consideration this year." Johnson had two shots on goal, three hits and won nine of 16 faceoffs at the inaugural CCM/USA Hockey All-American Prospects Game on Sept. 29 in Buffalo. In four games for Lincoln (6-0-0), Johnson has one assist and a minus-2 rating. "He's skilled, [but] the physical maturity hasn't come yet," NHL Network analyst Craig Button told NHL.com. "For a lot of players, going to college, especially a player like him, really benefits them. The biggest thing they need is time to physically develop and physically mature. For him to be successful, he needs physical maturity. It [college] is a good, slow build." Eamon McAdam, G, Waterloo -- Both Waterloo goalies, McAdam and Petersen, enter the 2012-13 season with high draft expectations. McAdam, a late 1994 birthdate who heads into his first draft-eligible season, gets the nod by a hair over his teammate after being named best goalie of the Junior Club World Cup in Russia in August. McAdam, the bigger of the two goalies (6-2, 185), sported a 2.17 goals-against average and .915 save percentage in four starts for the Black Hawks. Committed to Penn State next fall, McAdam will represent the United States on the 2012 Junior Select Team in the World Junior A Challenge, to be held Nov. 5-11 in Yarmouth, Nova Scotia. "He relies mostly on his size and angle play, is very good at getting his body in front of shots and has a good strong butterfly … he doesn't leave many holes for shooters," Jensen told NHL.com. "He's very strong in his crease when players cut hard to the net or when trying to gather any loose pucks. Technically he's good at retrieving back to his post and very good at directing his rebounds out of danger." The Perkasie, Pa., native appeared in 23 games last season with Waterloo and produced an 11-7-0 record with a 3.50 goals-against average and .882 save percentage. Through three games this season, he is 3-0-0 with a 1.33 GAA, .961 save percentage and one shutout. Mike McCarron, RW, USNTDP -- What impresses scouts most is McCarron's ability to move at high speed despite his 6-5, 228-pound frame. McCarron, who's committed to Cornell, had six goals and 27 points in three games for the NTDP U-17 team last season. "There are a lot of big guys I've seen that have the ability off that first step to get going, and he's moving at high speed right away," Gregory said of the B-list skater. "From last year to this year, he's starting to handle the puck more and gaining that confidence where he can be more productive offensively than we originally thought. I see him as a guy moving up the ladder." McCarron, whose brother John skated for the Lincoln Stars of the USHL before joining Cornell, has one goal, three assists and 10 penalty minutes in 11 games this season for the U-18 team. "[McCoshen is] definitely an attractive pro prospect, and you can see his game will translate well to being a pro … he has ice in his veins." Ian McCoshen, D Waterloo -- The 6-2.5, 207-pound two-way defenseman is the complete package. He can skate, is strong in his own end and offers a mean streak to boot. "He's definitely an attractive pro prospect, and you can see his game will translate well to being a pro … he has ice in his veins," Gregory said. "He handles all situations well and uses his strength. Once he starts to understand how much more he can dominate with his size and strength, he'll improve even more." McCoshen, who also is good along the boards and clearing out the crease, had eight goals, 20 points, 43 penalty minutes and a plus-4 rating in 55 games last season with Waterloo. The native of Faribault, Minn., has one assist and a plus-5 rating in five games this season. Tyler Motte, C, USNTDP -- The 5-9.25, 190-pound forward is a human highlight reel in waiting whenever the puck is on his stick. He's a bona fide point producer with speed and skill. "He's special with the plays he makes and the speed at which he makes them," Gregory said. "To me, that's what gets you fired up about him. He's not afraid and works hard. You never know how his size will translate to the next level, but I don't think you really need to worry about Motte's size right now. You just worry about his development and then, later on, make a decision on size." In 11 games this season with the NTDP U-18 team, Motte has two goals, six points and 16 penalty minutes. The University of Michigan-bound sparkplug had 25 goals, 41 points and 62 penalty minutes in 53 games with the U-17 team last season.